Any browser you use for browsing internet, saves the history of your browsing including forms, password data etc to keep track you in their eyes and keep log you in, in the next session with the websites you used in the previous session. Sometimes you may need to delete your browsing after you quit your browser and stop browsing anymore. There may be your own reason you might interested to make your browser to don’t save your browsing history after you exit your browser. Let suppose you’re browsing on your friend’s computer so in that case you might need to clear the history when you close your browser. In this case i think activating private browsing mode in your browser will also a good choice with you. 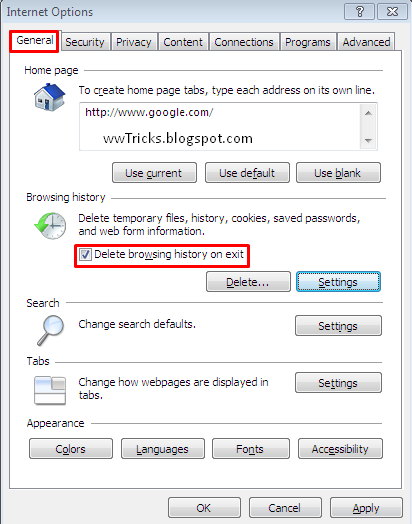 Anyway, you may have any other reason that you want to make your web browser to delete the browsing history when you close your browser,Here we're in this post, going to share the method of doing this settings in your browser. Here we'll be discussing the method for mozilla firefox and Internet Explorer because these browsers allow you to do so, Google chrome and opera has no options to do so. browser while using Mozilla firefox browser. All to do is what in the below steps. Step-1: First of all click on Purple Firefox menu button situated at the left top of the Mozilla firefox browser. And then select “Options”. Step-2: Now here at a new little window, switch to the “Privacy” tab and then here you have to select “Use custom settings” from the ‘Firefox will’ drop down arrow. Step-3: Further, you’ve to make a tick mark on the radio button in front of “clear history when firefox closes”. Now everything you were needed to do is done! After that whenever you close your firefox browser, all the history including the Form, active login’s, search, forms and cookies data will erase automatically. Tip: One further tip I would like to share with you that you can also choose what type of history data you want to be automatically deleted when you close your browser? So to choose what, then after you tick on the appropriate button, you will see just at the end of it an option “settings” you can choose one the history you want to be erased automatically as a new box appear. Now the process of erasing browsing history on the IE browser is just as discussed below. Step-1: After you launched the internet explorer browser on your computer, move your mouse on “tools” present at the right top of the internet explorer browser. Click on tools and moves down your mouse to “Internet options”, Click on it and see further in the next step. Step-2: After clicking on appropriate button you will see a new little window where in the general tab, under the ‘Browsing History’, you will see some words like that “Delete browsing history on exit”. Here what you have to do is to make a tick mark on the button you see just in the beginning of this. Just like the Mozilla firefox, it also allows you to choose what type of history data you want to delete when you close your internet browser. So friends! above we discussed that how to make a browser to automatically erase all of the browsing history after you close your browser, i hope the post was helpful for you. Also do share this on your social networks to help us! We'll be thankful to you very much!!! We appreciate your comments related to any post!